Sports Sandals are the favorite footwear that ladies tend to wear, when they are going out on a summer vacation or just want to wear that looks stylish and comfortable on their legs. In this article, we’ve researched and analyzed models of sports sandals from popular brands 2017. Our criteria for selection included that the footwear should be somewhat stylish, comfortable to wear, lightweight and breathable. If you are a person who likes to go outdoors and have fun in the wild, hiking, going rafting and exploring mountains, then the Whisper Sandals from KEEN are the best choice. They are lightweight, airy and makes the perfect sandals for the all-around adventurer. Provide a secure and comfortable fit and easy to adjust and stay good both on wet and dry surfaces too. The upper is easily washable and the footbed is extremely cushioned and provides great comfort to your feet. The Teva Women’s Tirra Athletic Sandals look stylish, lovely and bright and they are the perfect sandals for people having any arch problems. The sandals are made using high-quality imported textile and synthetic materials. The rubber outsole provides much-needed grip and a water channeling. Lug pattern makes these sandals perfect for walking or running around in the water. Multiple adjustment options provide you with a secure fit. It also performs well in rough terrain too and has the best footbed among all sports sandals. The Merrell Women’s Adhera strap sandals look stylish and they are very comfortable for your feet. No breaking in needed as they fit in immediately. They are also a lightweight and good solution for all day wearing. The Atika Women’s Maya strap sandals are more of an open and spaciously designed sports sandals with high-quality nylon straps. Even though it sports a traditional sandal design, it comes with the added flare and style to distinguish it from other models. You can use it both on wet and dry areas as the Maya strap sandals come with a multi-directional rug pattern. The inner sole in the sports sandals contours according to your feet shape and provides a smooth feel while walking. The Ecco Women’s Yucatan Sandals are extremely lightweight and the perfect variant for outdoor wearing with this sturdy nubuck upper and versatile design. Equipped with stretch-fit material lining, your feet stay fresh all day long. It also provides optimal comfort, thanks to the unique tread pattern. In outdoor terrains when you go climbing or trekking, you can feel the superior grip and traction. Sole is made using high-quality materials to provide that added support and wearability. Read our full review on ECCO Anniversary Yucatan Sport Sandals. Chaco has been in the footwear scene from 1989 and what made them popular is simple, streamline and a timeless sandals’ design made up of only 8 components. Provided with adjustable straps, you can be assured that your sandals fit perfectly to your feet. Another unique feature that makes the Chaco ZX2 one of the best comfortable sandals is its podiatrist certified LUVSEAT PU footbed and also an all-day footwear. When it comes to Chaco line of footwear, you can rest assured about the fit, function and great comfort in their sandals. All Chaco footwear features the APMA seal of acceptance, meaning they are tested and qualified. Brand Ryka uses the all-new foam reflexology technology with a lightweight EVA footbed that is perfect for the woman on the move. The upper is designed with a complete foot coverage with cut-outs and mesh inserts to allow airflow and to keep your feet cool and comfortable. Based on our reviews, we can find a winner. It’s KEEN Women’s Whisper Sandals. 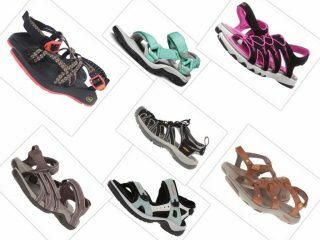 We’ve selected only the best models in the women’s sports sandal categories and each model outperforms the others in one or other criteria. Hope we’ve provided you with a clear and precise analysis on the best women’s sports sandals. What to Wear Sports Sandals with? Sports sandals – a very special type of shoes, which until recently caused a lot of heated discussions among designers and stylists around the world. Some argued that the sandals are intended solely for summer rest, others argued that such shoes are exceptionally convenient for outdoor activities and quite appropriate in the city. Today, sports sandals are perfectly combined with any sportswear, as well as with equipment for outdoor activities. They look great with shorts and trousers in the casual style, as well as jeans clothes. Many items of women’s wardrobe in military style are harmoniously completed with sports sandals, including skirts and dresses. Sports tops and T-shirts are also perfectly complemented by sports sandals. During outdoor recreation, to protect from rain and cold, you can wear a light windbreaker or a thin sports sweatshirt. How Do Sports Sandals Differ from Other Sandals? Trekking or sports sandals are an excellent option for hiking, long trips and just picnics on nature. In the heat they allow the skin to breathe, do not rub and are simply comfortable with prolonged wear. The external differences of sports sandals are immediately evident, they are not as refined as classic or Roman, in the guise of brutal traits in the form of aggressive off-road soles and all sorts of carbines and stickers, the female version is cut, of course, slightly more masculine, but the functionality is usually the same . How to Choose the Best Sports Sandals? What are the parameters of choosing the right sandals? The first thing is convenience. You should choose the pair of sports sandals, which you can wear to walk long distances and still feel comfortable in them. To buy sports sandals is better in sports or tourist shops, it is there that are more likely to buy exactly what you need, rather than pseudo sports sandals that will bring more disappointment afterward. It is necessary to try on sandals before buying. The material should be soft and durable. The sole in most cases determines the period of wearing sandals. The leather sole is considered to be the most durable, provided it is of high quality. Rubber and polyurethane soles are most frequently used. The sublayers made of synthetic materials are very practical, they make it possible to make a kind of sandwich of two or more layers. Practice shows that when choosing a sole, one main rule works: the upper part (the insole) should not be too stiff, rather anatomical and soft, and the lower one, accordingly, should not be too soft, but denser, otherwise the foot will be tired, and such sandals will be erased as quickly as shales on hot asphalt. It is desirable that the shoes were with a moderate protector. Sandals should fit tightly on the leg, the straps should be well regulated and not press on the leg. The material of sandals strongly influences not only their style but also comfort. The straps on the sandals should be strong and soft at the same time. In hot weather, the legs sweat brutally, this aspect can cause a slight irritation and add a couple of extra and unnecessary calluses. Therefore it is very important that the upper part of the sandals be pleasant and soft to the touch. To date, the footwear industry offers a huge number of fabrics for shoemaking. As always, the classic option is the natural leather. Leather sandals enjoy constant popularity, despite the season and its purpose. The leather is not only durable, it does not allow air to enter, allowing legs to breathe, which is important in the heat. These shoes do not rub, allowing you to wear them comfortably. In addition, leather sandals – this is a very stylish version of summer shoes. Textile sandals are also very practical, although compared with leather look a bit simpler. But sandals made of fabric can be no less convenient and reliable. When choosing shoes, always pay attention to the softness to the touch because rough and tough synthetic fabric can cause problems and you will soon throw out your new footwear. Artificial leather or suede sandals can be a good alternative to their authentic counterparts. Today’s faux leather is so perfect that sometimes such sandals are not much inferior to the real leather. Shoes made of artificial leather can really be soft and comfortable to wear, and from an aesthetic point of view often outperforms their cow-piggy ancestors. In general, when choosing comfortable sandals for yourself put on sandals, walk, jump, feel them on your leg and buy only if you don’t feel any inconvenience. Ecco sandals are the most comfortable sandals I have ever had. Very comfortable shoe for walking, hiking and daily wearing. The footbed has the good arch support. Fit snug and will be suitable for any surfaces. True to fit. Love Merrell sandals. Have excellent arch support and non-slip bottom. The straps made of natural leather that’s why the are so soft. I think these are perfect summer footwear for me. I have problems with plantar fasciitis so I need special footwear. Sandals from Teva have a fantastic special construction and extra soft inner sole. I can wear these all day and don’t feel tiredness. These sandals provede great shock absorption. I got Teva sandals for a week trip to China. They are perfect! Really comfortable and have great support. Earlier I bought other brands, but now I’m in love with Teva! I want to write about Ryka. They are so comfortable. I have been wearing them all day. I always buy sandals of this brand. They never failed me. I wear one of my three Teva pairs almost every day in the summer. They provide absolute comfort with two adjustable straps. The support is really great for my problem feet. I don’t like sandals in general, because they are usually too massive. But not Chaco. They have not only excellent support but also look good. Thin straps and original sole made them my favourite. I’ve had Ecco sandals for 2 years and they still look good. They have great arch support. I can wear them all day. Teva runs true to size. The best sandals for me, because I’ve had the same sandals for 3 years. Wore them walking around ancient towns, hiking forested trails and at the beach. Great footwear!! !